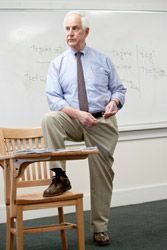 Groton encourages the study of Latin and Greek because of particular benefits it offers in the development of language skills and the perspective it offers into our culture in a broad sense. Latin and Greek are the basis for several World Languages and can be useful aids in learning them. However, the study of a classical language is fundamentally different in its approach and goals from that of a modern one. While the learning of a World Language concentrates on developing fluency of speech and listening, the learning of a classical language focuses primarily on the structure of the language itself. It encourages precision with words and offers valuable lessons for close reading and written expression in English. Beyond language skills themselves, classical languages offer the best access to the cultures of Greece and Rome. These cultures form the basis for much of our modern thinking. Go wherever you wish in literature, history, art, architecture, philosophy, government – even math and science – and you will find that the Greeks and Romans have been there before you. They will not be able to answer your every question, but they will usually have addressed and thought about it with perception. The clarity of their approach, reflected in the kind of language they used, will train you well to pick up on your own thinking where they leave off. To a culture like ours, so preoccupied with its own immediate present, these languages open channels not only to the classical world, but also to all the interwoven cultural traditions through the millennia that separate us. Classical studies specialize in close reading and mental discipline while opening out onto a wide range of subjects from a readily grasped core. NOTE: Students who begin a classical language must complete at least two years of that language. 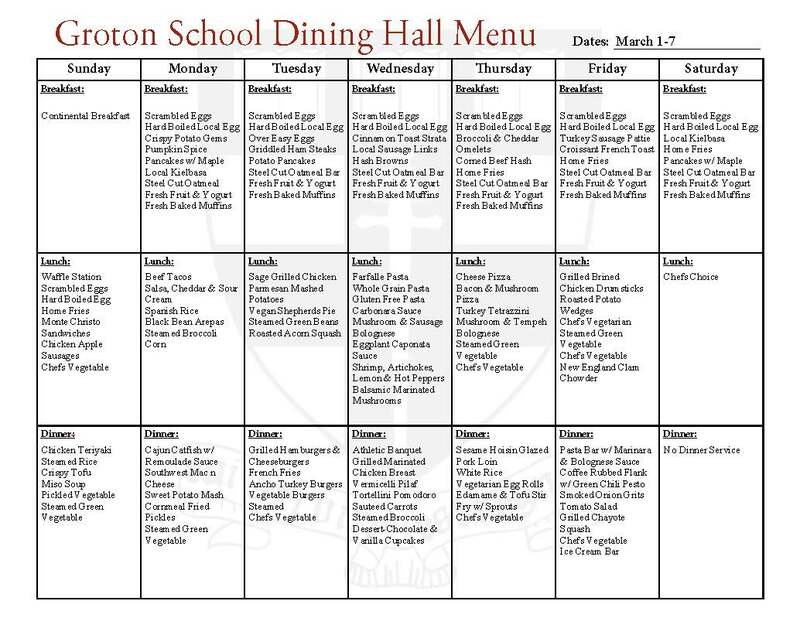 In particular, Upper Schoolers who begin Greek should plan their future schedules accordingly. In this course, students read selections from Books 1, 2, 4 and 6 of Vergil's Aeneid and from Books 1, 4, 5 and 6 of Caesar's Gallic Wars, as required for the Advanced Placement Examination. In addition to translating, discussing and analyzing these passages, students also read in English Books 1, 2, 4, 6, 8 and 12 of the Aeneid and Books 1, 6 and 7 of Caesar's Gallic Wars. This course is designated as an Advanced Placement course and thus a full-year commitment for all students. Open to Sixth Formers. Greek Archaeology is the study of the architecture, sculpture, and painting of Ancient Greece. The principal text used will be W. Biers, The Archaeology of Greece. Classes will combine illustrated lectures with oral presentations by each student, who will be asked to pursue one or two topics in greater depth in research papers. Enrollment limited to six students. Open to Sixth Formers. This course is an introduction to the archaeological method, followed by the study of early Greece and Crete. Sites studied will include Troy, Knossos, Mycenae, and Pylos. The principal text used will be Hitchcock and Preziosi, Archaeology of the Aegean. Classes will combine illustrated lectures with oral presentations by each student, who will also be asked to pursue one or two topics in greater depth in research papers. Enrollment limited to six students. Open to Fifth and Sixth Formers. Roman civilization has provided the culture basis for much of the Western artistic and architectural tradition, and evidence for its influence is even found in early Islamic buildings and art. The class will follow the development of Roman art and architecture from its beginnings in Etruria into Late Antiquity and the Islamic period, using archaeological evidence from Rome itself and its Empire. After a study of material from Rome and other Italian sites such as Pompeii, the class will look at Roman art and architecture in Europe (Provence), North Africa (Carthage, Leptis Magna), Egypt (Alexandria), and the eastern Mediterranean (Petra, Palmyra), followed by a consideration of Roman influence on late antique art and architecture (Antioch, Constantinople, Ravenna). The course will conclude with a brief overview of the classical legacy in early Islamic art and architecture (Jerusalem, Damascus). Students will give oral presentations on particular topics, with three formal essays involving archaeological research submitted over the term. Enrollment is limited to 10 students. The Greek 1 curriculum is designed to cover most of the essential grammar and basic syntax of the language within a year, along with vocabulary-building and practice in reading. In Greek 2 students review and expand upon the grammar and syntax they studied during the first year through the close reading of Greek literature. Readings include selections from Xenophon’s Anabasis in the first half of the year followed by selections from Homer’s Iliad. Greek 3 is a reading course. In recent years works read have included Sophocles’ Antigone and Oedipus Rex, Plato’s Apology and Phaedo and selections from Homer’s Odyssey. Readings may vary from year to year and are chosen at the discretion of the instructor and Classics Department. Readings are chosen by the instructor. The Latin 1 curriculum covers the essential grammar and basic syntax of the language within a year. On a daily basis, students translate practice sentences and longer, narrative passages designed to reinforce grammatical topics and to help develop fluency in the language. Discussion of various topics associated with these readings serves to expand the students’ awareness of a wide range of Roman realities. Latin 2 begins with a quick, thorough review of the essential grammar and syntax covered during the first year of study. In conjunction with this review, students also translate Latin from the Libellus, an episodic survey of Roman history featuring adapted excerpts from Livy and other Roman historians, before moving on to selections from Caesar’s Gallic Wars in the Spring Term. This course aims to make students proficient readers of Latin while providing a good overview of Roman history. Latin 3 aims to develop further students’ proficiency in the language while introducing them to representative works of Latin prose and poetry. Students study prose in the first half of the year, typically selections from the works of Cicero, and poetry in the second half of the year with selections from Vergil’s Aeneid. Latin 4 offers students the opportunity to continue to read, analyze, and discuss representative works of Latin prose and poetry. In recent years this course has focused on selections from a range of Roman authors including Ovid's Metamorphoses, Catullus' Carmina, Horace's Odes and Vergil's Aeneid. Readings may vary from year to year and are chosen at the discretion of the instructor and the Classics Department. Sixth Formers take this course on a term-by-term basis. The literature studied in Latin 5 may vary at the discretion of the instructor and Classics Department. In recent years, course topics have included the lyric poetry of Catullus and Horace, the philosophical writings of Cicero, the didactic poetry of Lucretius, comedies of Plautus, and selections from the works of Ovid, Seneca, Apuleius and other Latin authors. These courses are offered on a term-by-term basis to Sixth Formers; all others must elect Latin 5 for the full year. Classics Department Head Scott Giampetruzzi is broadly interested in the history and literature of Greece and Rome and has devoted his attention more recently to the development of distinctively Roman views on philosophical thought in the literature of the late Republic and early Principate. He holds the Sherrard Billings Chair of Classics, established in memory of Reverend Sherrard Billings, one of the three original masters when the School was founded. Scott arrived at Groton School in 2003, where he has taught Latin and Greek at all levels and coached soccer, baseball, and lacrosse. He became the head of an Upper School boys’ dorm in 2009, and before that, he was affiliated with a second form boys’ dorm for six years. Scott has a BA from Colby College and an MA from Fordham University. He resides in Giampetruzzi’s Dorm with his wife, Kathleen, and his son, Gus, and already is looking forward to the 2014 World Cup in Brazil. Mary Frances Bannard joined the teaching faculty at Groton in 2016. She did her undergraduate work at Middlebury College and the University of Virginia, and earned an MA in Classics from Bryn Mawr College, where she wrote her thesis on culinary metaphors in imperial Roman satire. Before coming to Groton, she taught middle and high school Classics and served as a grade level dean at the Agnes Irwin School in Rosemont, PA; she has also taught Latin at Nashoba Brooks School in Concord, MA. At Groton, Mary Frances runs a Third Form girls' dorm and teaches in the Classics Department. She also assistant coaches girls cross country, helps with technical theater, and teaches the occasional yoga class. She lives on campus with her husband, Preston, also a member of the Classics faculty, their three daughters, and two dogs. 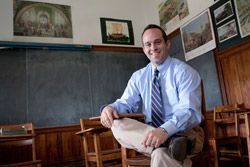 Preston Bannard, son of two former Groton faculty members and a graduate of the Form of 2001, returned to the Circle for a third time in 2014 as a member of the Classics Department faculty. Preston is particularly interested in Greek and Roman history and historiography, as well as epic poetry. He came to Groton after receiving an AB from Princeton and an MA from the University of Virginia, and teaching for seven years at the Baldwin School in Bryn Mawr, Pennsylvania. Preston lives on campus with his wife, Mary Frances, who also teaches Classics and runs a Third Form girls dorm; their three daughters; and two dogs. In addition to teaching, he coaches basketball and baseball. 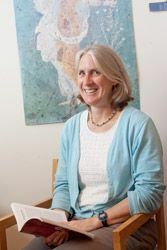 Kate Dennison began her teaching career at Kimball Union Academy and joined the Groton faculty as a Classics instructor in 1985, after earning a master’s in Latin at the University of Michigan. At Groton, she met her husband, Science Department Head Stephen Belsky. Following a sabbatical, Kate returned to campus as director of Academic Support, but within a few years had added teaching and coaching back into her schedule. She now coaches the thirds girls field hockey team and is assistant coach of the girls varsity basketball team. In addition to her master's degree, Kate holds a BA from Wheaton College and an MSW from Boston University. She says her greatest appreciation for Groton surfaced in the last few years, when all three of her children—twins Molly ‘12 and David ’12 and brother Jared ’15—became students. Kate describes the experiences they have had—in the classroom, on the sports fields, in the theater, in the choir, and beyond—and the relationships they've built with adults and peers as “invaluable” to them and affirming to her. Amy Martin-Nelson is a member of the Classics Department faculty and teaches Latin I, Latin II, Latin IV Ovid, and Latin IV AP Vergil. She began her teaching career at The Seven Hills School in Cincinnati, OH, and came to Groton from All Saints’ Episcopal School in Fort Worth, TX. She is a reader for the AP Latin exam. Amy has trained as a classical archaeologist and has excavated in Carthage, Tunisia,and Arras, France. She has a BA in classical archaeology from University of North Carolina, Chapel Hill, and an MA in Latin from University of Georgia. At Groton, Amy coaches the girls third soccer and basketball teams. She lives on campus with her husband, David, and their dog, Ollie. When she is not teaching or coaching, she enjoys hiking, cycling, and reading. Mike O’Donnell came to Groton as dean of students in July 2012. In addition to his work in the Deans’ Office, he teaches Latin and US History, and coaches girls cross country. Prior to joining the faculty at Groton, Mike taught history and Latin at Ransom Everglades School in Miami, was associate dean of students and director of residential life at St. Mark’s School, and taught Latin at the Fessenden School. He attended Noble and Greenough School and holds an AB in Classics from Dartmouth College and an MA in Latin and Greek from Boston College. A Groton graduate of the Form of 1980, Andres Reyes spent his undergraduate years at Harvard, earning a classics degree, which he then took to Oxford, where he completed his doctorate. Andres remained at Oxford as a junior fellow at St. Hugh’s College until 1993, when he returned to Groton as a member of the faculty. In May 2011, he published an edition of C.S. Lewis' translation of Virgil's Aeneid (Yale University Press, London). In addition to teaching, Andres supervises the School's Debating Society (founded in 1884). He holds Groton's Charles C. and Ann W. Alexander Chair. Prior to his arrival on the Circle, David Ross taught for eight years at Yale University and for 27 years at the University of Michigan (Ann Arbor). During that time he wrote four books on Latin poets. A member of the Groton faculty since 2001, David teaches Classics. He frequently can be seen watching birds and other wildlife on the many acres surrounding Groton School. A boarding school product himself, David attended Hotchkiss School. He has a BA from Yale and a MA and PhD from Harvard.